Flex-Hone® tools impart the ideal surface finish to cylinder walls. Made in the USA by Brush Research Manufacturing (BRM), these flexible cylinder hones mount in most any rotating spindle. 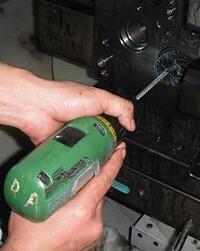 Some users chuck BRM ball hones in a handheld electric drill. 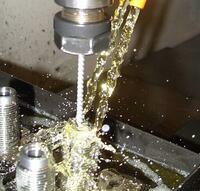 Others mount Flex-Hone® tools in a drill press, milling machine, or lathe. Flexible cylinder hones can be used with CNC equipment and industrial robots, too. No matter how you use them, Flex-Hone® tools come with some best practices. For example, enter and exit the bore while the ball hone is spinning. Slow down your RPMs to keep the tool cool. Don’t over-hone by stroking too much. Last week’s blog entry listed a total of ten tips. This week’s article takes a closer look at some best practices related to speed and stroke rate. First, it’s important to remember that you need to rotate the Flex-Hone® tool before entering the bore. Always lubricate the tool generously, too. For best results, remove the ball hone while it’s still spinning. That helps create a cross-hatch pattern on the cylinder walls. This uniform pattern of scratches or grooves promotes oil retention, which helps reduce friction and wear. Flex-Hone® tools can be run at speeds between 60 and 1200 RPM. Don’t run the tool at faster speeds because higher RPMs generate excess heat – and that can shorten tool life. In general, the spindle speed you need is a function of tool diameter. So before you hone, remember these two rules. Larger tools run at slower speeds. Smaller tools run at faster speeds. The Flex-Hone® Resource Guide contains suggested speed ranges, but you may need to perform machine trials for your surface finishing application. Stroke rate is the number inches per minutes (IPM) that are fed or stroked during flexible honing. This operating parameter rate is related to spindle speed and tool diameter, but stroke rate also determines the degree of the cross-hatch angle on cylinder walls. The following table explains. If your goal is to achieve a 45° cross-hatch angle, increase the stroke rate prior to exiting the cylinder bore. Also, remember these two guidelines about stroke rate and Flex-Hone® diameter. Smaller-diameter tools might require feed as high as 250 IPM. For more information about how to use flexible hones, download the Flex-Hone® Resource Guide.